What is the "New Mexico Boater Education Card"? Isn't the term "Boater Education Card" just another word for "Boater's License"? Do I have to get the Boater Education Card? What is the minimum age to operate a Powered Vessel including Personal Watercraft (PWC) in New Mexico? How do I get my Boater Education Card? What is the "Certificate of Completion"? Q. What is the "New Mexico Boater Education Card"? A. The Boater Education Card (sometimes incorrectly referred to as a New Mexico Boaters License) is proof that you have met the mandatory boater education requirements for the State of New Mexico. Q. Isn't the term "Boater Education Card" just another word for a "Boater's License"? A. No. Sometimes the New Mexico Boater Education Card is incorrectly referred to as a "New Mexico boating license" or license to operate a vessel. The two are not the same. In most instances what people are actually referring to is the New Mexico Boater Education Card. Unlike a driver's license, the Boater Education Card cannot be revoked and is good for life. The term "New Mexico boat license" is also sometimes mistakenly used to refer to a boat's registration numbers and/or certificate of title. Q. Do I have to get a Boater Education Card? A. As of January 1, 2007, all persons born on or after January 1, 1989 who operate a motorboat on New Mexico waters must have completed a State of New Mexico and NASBLA-approved safe boating education course. 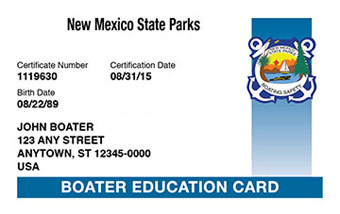 The resulting New Mexico Boater Education Card must be carried onboard during operation. Q. What is the minimum age to operate a Powered Vessel including Personal Watercraft (PWC) in New Mexico? A. In New Mexico there is a minimum age requirement for operating a motor powered vessel. The minimum age is 13 years old. Further in the state of New Mexico, a parent or guardian, or a person at least 18 years of age designated by the parent or guardian must be present on the vessel while a minor is operating the vessel. Moreover there is also a minimum age requirement of 13 years old, for those who wish to operate a Personal Watercraft (PWC) also must be accompanied by an adult while operating a PWC. No one under the age of 16 may rent a personal watercraft. Q. How do I get my New Mexico Boater Education Card? For a complete overview of the New Mexico online boating exam process, please visit our New Mexico Online Boater Exam Process page. Q. What if I don't pass the New Mexico Boating Test? A. No problem. There is no cost to retry the exam if you do not pass. You will receive your score and be allowed to review any of your wrong answers. You can then review the course material and take the exam again at no cost to you. A. There is a one-time fee of $29.95 paid to BOATERexam.com®. It includes unlimited attempts at the final exam. It also gives you access to an instant temporary certificate of completion as well as an official card that will arrive in the mail in 3-5 weeks. Learn more about BOATERexam.com's Risk-Free Policy. Q. What is the "Certificate of Completion"? A. The Certificate of Completion is a temporary proof of competency and proves that you took a boater education course and passed. This certificate is valid for 60 days from the date you take your exam and should should be carried with you when you boat until your permanent Boater Education Card arrives in the mail. Q. How many questions are on the exam? A. The exam consists of 60 multiple choice questions. Q. What is the passing grade?